I knocked the first book off of my 2018 Reading List early in January. I got this book for Christmas so I started it that day and it was a very quick read. 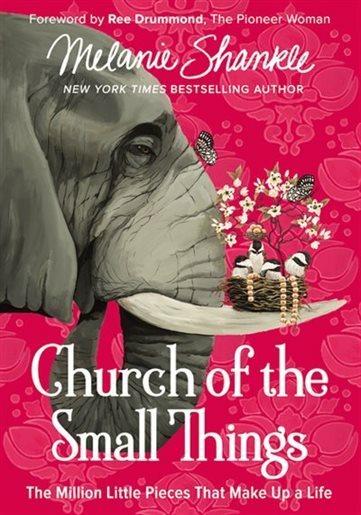 I started with Church of Small Things by Melanie Shankle. I did not read her two previous books but I think they are quite similar. The first one being about friendships and the second one being about marriage. The book was fine, a quick read, some funny stories, but it was not what I expected it to be. It was recommended by all of the bloggers I follow in Texas (presumably because the author sends them copies of her books for them to promote, although I do believe they genuinely like the book) so that is how I found out about it. 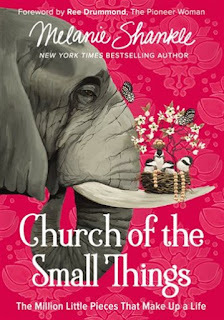 I was thinking that it would have some stories in it about things in her life and then she would relate them back to the "small things" for which we should be grateful, and that there would be more of a teaching/reflecting portion of the book. And although she did that a couple of times, it was mostly just stories about her, and although entertaining, didn't seem to fit the "small things" category. In the prologue, she references the bible story about the loaves and fishes, where Jesus takes the lunch that one boy brought with him, and multiplies it to feed the crowd. She says that the mother who packed the lunch for that boy would not have known that it would become something so important, she was just going about her day, making food for her kids, and completing the "small things". We are encouraged to rejoice in these small things because you never know what they could turn out to be. I write about this on a regular basis when I post about small things that really are the big things, so this was right up my alley. That's why I wished the book did more of those comparison type stories. I have another book that I think will do a better job of what I'm looking for. I've had it on my bedside table for awhile now and I've only ready a little bit of it. I hope to get through it next month and I'm hoping it will be more inspiring. It's called The Best Yes by Lysa TerKeurst. The tagline is a little dramatic: "Are you living with the stress of an overwhelmed schedule and aching with the sadness of an underwhelmed soul?" 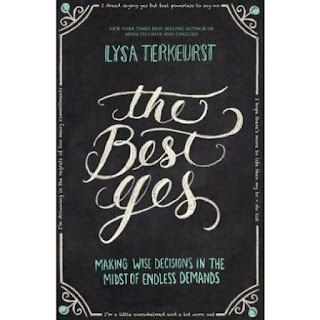 Uh, no and no, but from what I've gathered so far, it is about looking for God in your everyday life and making choices that do His work, so I'm interested. I read sparkly green earrings by melanie. It was okay, i thought.